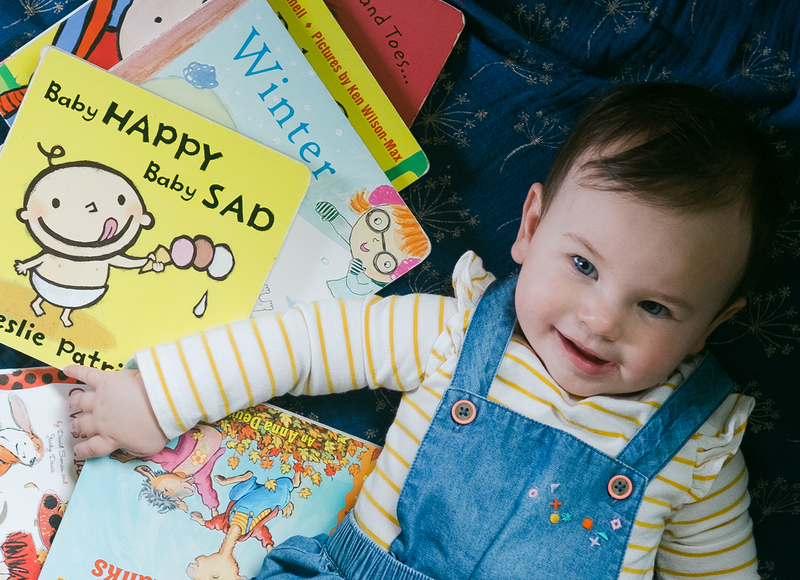 Finding books for babies under 1 seems like an easy task, but when you want to be intentional about the things you're reading to them while also holding their attention, you often find some books just don't engage babies very well - or mom and dad for that matter. The result? You find yourself knee deep in baby books that no one wants to read. The library has been a godsend in terms of exploring new titles before we make a financial commitment. It's no secret that I'm a book lover raising my daughter to love books too, and I really want to work on building her a permanent collection of children's books that are not only appropriate for the current stage she is in, but also remain engaging as she gets older. One of the things I enjoy doing with her is visiting the library weekly. The children's section of our local library has a shelf dedicated to baby board books. Anna loves crawling over to the shelf to practice standing while I select some I hope she'll enjoy. 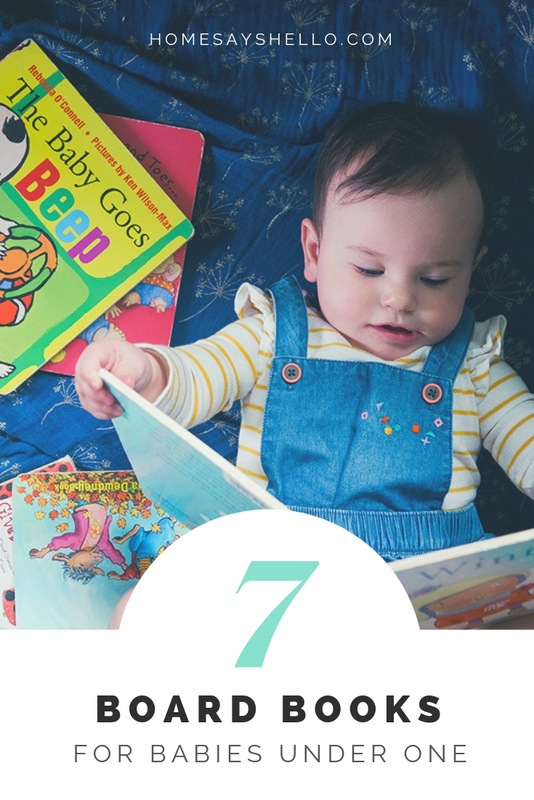 Last week we checked out seven baby board books, and below, I'm sharing why I picked these books, along with Anna's reaction (or as much as a reaction a 10 month old can have), and my final thoughts on these books which will reflect if I found the book worth adding to our permanent collection. My husband loves this author and gets a kick out of her books, so I picked this up more for him than for Anna. A shy hippo observes other animals participating in fun activities, wondering if she'll be included. She sits through this one and I wonder if she's starting to recognize the art style of this author. The rhymes are fun and this author's humor appeals to adults which makes this a great read for parents who get tired of the same ol' same ol' at bedtime. This would be a good book that could grow with Anna as Boynton uses some advanced vocabulary. We already have a few Boynton books, but according to my husband, there's always room for more! The bold colors and lines caught my attention for this one. A little baby stays busy all day long making different sounds. At first, she didn't really sit for too long with this one, but the more we flip through it, the more she becomes interested in the sounds I'm making. She loves to mimic the splashing page. I want to focus more on teaching Anna words associated with different sounds since she really understands "shake, shake, shake" in order to see if something will make a noise when she shakes it. This book definitely is helping to achieve that and actually gave me a few good ideas of how to reinforce the words. Anna loves when I sing the Head, Shoulders, Knees and Toes song to her so I figured having a book showcasing the song would be a hit in helping her to learn the body parts. For some reason, she is drawn to this one first out of the whole pile, but as soon as I start reading it, she's over it. I guess that's 10 month olds for you! A cute book to reinforce the different parts of the body as depicted in the song, but probably not a book we'll add to our permanent collection. Ever since we checked out Ladybug Girl Says Goodnight from the library, the Ladybug Girl series has been a hit with Anna. I was excited to see that there was a Thanksgiving themed book in the series. Ladybug Girl shares all that she's thankful for in life. Much to my surprise, Anna just doesn't care much for this one. While we love Ladybug Girl, I don't think this one will find it's way on the permanent book shelf. I feel that there will be far more beautiful and meaningful books about Thanksgiving in Anna's future. I gravitated toward this because I was looking for books that showcase Thanksgiving imagery. Llama Llama spends the day preparing for and celebrating Thanksgiving with family and friends. I read this to her at bedtime and she kept wanting to flip through it over and over. I think the rich colors were appealing to her. The rich, warm colors and familiar sights of Thanksgiving were really appealing in this little book. The words are sweet and simple for babies with short attention spans. I might add this one to the permanent collection since it's just so warm and cozy. I definitely want to explore other Thanksgiving titles before I commit. Good for: identifying the sights of autumn and typical Thanksgiving traditions. I've seen this book series a lot and honestly, I find it to be rather ugly, but since it's everywhere, I decided to give it a try. We recently got "It's Pumpkin Day Mouse!" for Anna and she seemed interested in the facial expressions on the Jack-O-Lanterns, so I thought I'd try another book that covered facial expressions. A humorous look at happy and sad emotions through the eyes of a baby. I really wasn't sure how she felt about this one until the very end of the book. She liked the last two pages that showed all the different ways the baby can express sad and happy. She chuckled a bit and wanted to keep the book open to look at it. The illustrations are bold and simple which makes the expressions stand out, and I think the book can definitely help communicate happy vs sad. However, I feel the reasons why the baby is happy or sad will be lost on babies until they're a bit older. Good For: Toddlers who will understand the actions the baby in the book is displaying. Over the summer we read Summer by the same artist, and Anna loves the illustrations. Since winter is approaching, I thought it would be nice to start talking about the different things associated with the upcoming season. Follow along as children discover the everyday sights and experiences of the winter season. She really loves flipping through this one. There's so much on each page to point to and talk about from the weather, to household items, to animals. I also think she loves looking at the children's faces. I was surprised at how much she wanted to flip through this one. I know she doesn't really understand things like snow and what it means to have cold toes, but it's fun talking about these things with her and anticipating the time when she'll be able to experience winter first hand. Just like with the Llama Llama Gives Thanks book, I'm going to keep this one on the back burner while I explore other books about the seasons. Good For: identifying the sights, sounds, and every day activities that occur during the winter season. 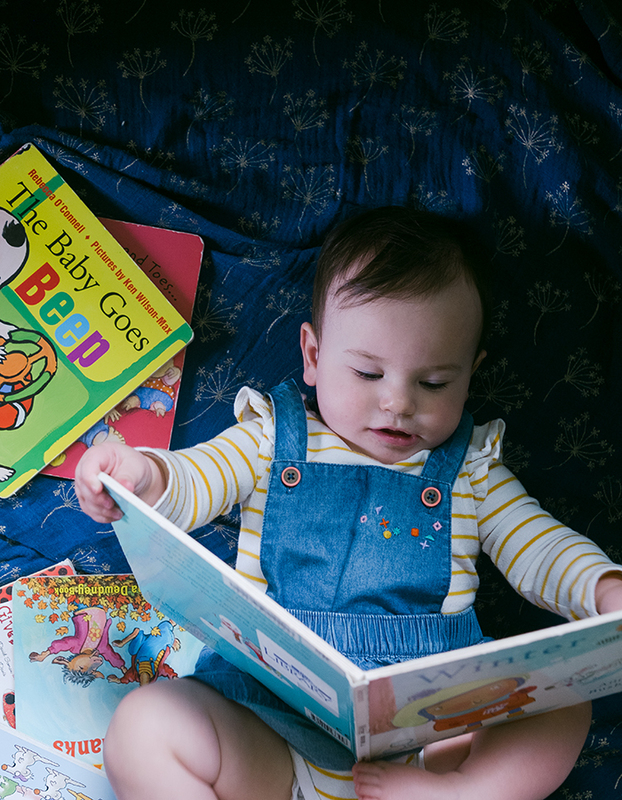 What library books have you discovered that made it into your permanent collection of baby books?